Truth is being denied, hated, rejected, and reinterpreted, and many – even within the church – are falling for the deception. Irreparable damage has been done to the foundations America was built upon. We now live in a culture that has embraced moral relativism, a generation that no longer believes truth can be known. Right and wrong, good and evil are measured by feelings and opinions. It is all part of a satanic delusion. Redefining Truth provides answers and biblical perspective to the most pressing issues in today’s postmodern society. David Fiorazo, one of the most brilliant author’s I know, is notably humble yet intensely bold in raising a standard for biblical truth in a post-modern culture. I am confident that this book, Redefining Truth, will play a profound part in helping the reader discern God’s truth while defining the foundation of the gospel that saves us! CLICK TO ORDER REDEFINING TRUTH BY DAVID FIORAZO! Can Natural Marriage Be Saved? What Do Mormons and Catholics Believe? At a time when truth is being denied, hated, rejected, and reinterpreted, many are falling for the deception. Irreparable damage has been done to the foundations America was built upon. We now live in a culture that has embraced moral relativism, a generation that no longer believes truth can be known. Right and wrong, good and evil are measured by feelings and opinions. It is all part of a satanic delusion and much is at stake. 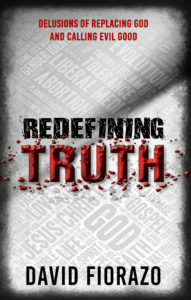 Redefining Truth provides answers and biblical perspective to the most pressing issues in today’s postmodern society. Do you sometimes feel overwhelmed by the darkness and moral decline in society and wonder what happened to the salt and light? There are consequences when Christians back out of culture, and America is suffering the affects of decades of increasing immorality. Christian in name only, America has become an epicenter for the culture war as too many of us keep ducking the issue of sin. 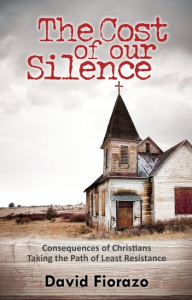 Due to decades of Christians being silent, failing to preach the gospel and speak the truth in love, we’ve reached a tipping point in which Political Correctness refuses to coexist with religious freedom. Why do you think Christians who defend God’s Word are often called hateful, intolerant, or judgmental? There are consequences in this life and for eternity, when Christians take the path of least resistance. We cannot reverse the moral decline, but we can choose to stand for righteousness as we pray for revival, speak the truth in love, and be the salt and light Jesus called us to be while we’re still here. The truth is – silence never saved anybody. Too many “professing” believers seem more comfortable blending in with the world rather than being set apart from it, and our apathy is killing us! In the last hundred years in America, we have not only invited evil in, we often justify it. Jesus Christ is standing outside knocking on the door of a wayward, lukewarm church, hoping we will welcome Him back in before it’s too late. Are we willing to get out of our comfort zones, take a risk by boldly living our faith, and trust Him with the results? If not you and I, who will?